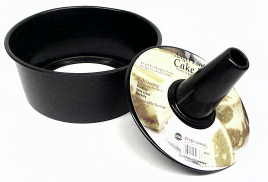 This tube cake pan has a loose bottom for easy cake removal. It provides even heating and is rust resistant. Tube Cake Pan Nonstick 10"
This pan is also known as an Angel Food Cake Pan. It is high quality, nonstick, constructed of heavyweight, durable, aluminized steel that distributes heat evenly and will not twist or warp over time. Coated with removable bottom for easy food release and cleanup. Pick one up for your bakery or home kitchen! 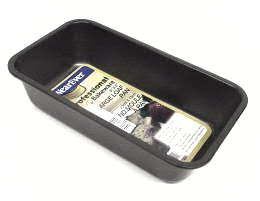 This loaf pan features premium improved non-stick coating. The color is a richer, warmer gray. The metal is spatula and dishwasher safe. Great for your bakery, home kitchen and more! Measures: 9 1/8" x 5 1/8" x 2 1/2". This pan is great for breads, cakes and side dishes. It is made of durable aluminized steel with RESIST Plus non-stick coating for easier release. Dishwasher safe. Pick one up for your cafe, bakery or home kitchen today. Sweeten any special occasion or meal with a delicious shortcake, lemon bars or brownies. Each cake pan is made of durable aluminized steel with RESIST Plus non-stick coating for easier release. Dishwasher safe. 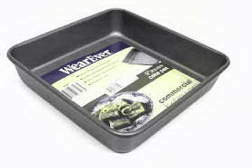 This cake pan features rolled edges which prevent warping over time. 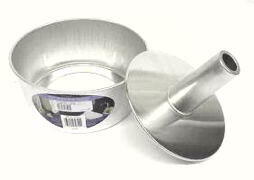 Each cake pan is made of durable aluminized steel with RESIST Plus non-stick coating for easier release. Great baking pan for moist and consistent cakes and brownies plus much more. Dishwasher safe. Perfect for your restaurant, cafe, bakery or home kitchen. Delight your guests with cupcakes or muffins. This is an exciting innovation that will help you create truly inspired baked goods. The pan has 12 nonstick cavities. Dishwasher safe. 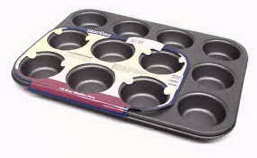 Ideal for cakes, brownies, pastries and bar-type cookies. Completely seamless and simple to use with no extra metals, welds, or chemical coatings. Non-reactive to tomato sauce and citrus ingredients, so these pans are perfect for casseroles, lasagnas, and roasts. Heat faster and cool quicker allowing your recipes to turn out the way they should. Perfect for your restaurant, bakery or home kitchen. 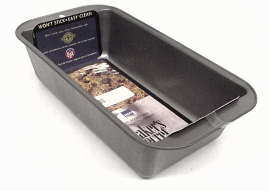 Measures: 9" x 13" x 1-5/8"
This aluminum bake pan features a 2 1/4-inch depth that makes it excellent for all sorts of culinary endeavors beyond brownies and other baked goods. Measures: 11" x 17" x 2-1/4"
Use for cookies, breads, rolls, pastries, and many other purposes. The perfect choice for all your professional baking needs in your restaurant, cafe, bakery or home kitchen. 18 gauge full size aluminum baking pan. Measures: 13" x 18" x 1"
Use for cookies, breads, rolls, pastries, and many other purposes. The perfect choice for all your professional baking needs. Great for your commercial kitchen, bakery or home kitchen. Measures: 16" x 22" x 1"
Use for cookies, breads, rolls, pastries, and many other purposes. The perfect choice for all your professional baking needs whether in your bakery, restaurant or home kitchen. Measures: 18" x 26" x 1"
Use for cookies, breads, rolls, pastries, and many other purposes. The perfect choice for all your professional or home baking needs. 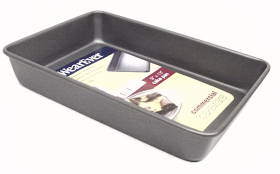 Bake Pan Aluminum with Handles 18" x 26" x 3 1/2"
Make it easy using the handles to lift out of the oven preventing burns. Commercial size aluminum baking pan. Pick one up for your commercial kitchen! Measures: 18" x 26" x 3 1/2"
The wide slots on this commercial toaster are perfect for making Texas toast, bagels, and more. Made from stainless steel, this 4 slot toaster is a durable piece of countertop cooking equipment ideally suited for medium-duty use. The 4 slots allow you to toast several items at the same time to ensure maximum speed and efficiency of service. Two independent browning settings let you simultaneously cook different items for varying lengths of time to achieve precise results. A removable crumb tray on this toaster makes cleanup simple. Perfect for your small restaurant, sandwich shop, grill, food truck or home kitchen. Stainless steel, 24 quart roaster. Perfect for roasting that turkey, chicken, casseroles and veggies. Pick one up for your home kitchen or commercial establishment today! An easy way to make great grilled jalapenos, armadillo eggs, stuffed jalapenos and poppers. Cooks stuffed jalapenos to perfection. Holds 36 jalapeno poppers. Dishwasher safe. Pick one up for your food truck, snack bar or for your next backyard BBQ. 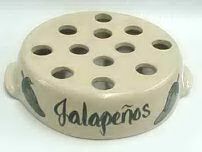 This pepper crock will hold up to 12 Jalapeno poppers. Safe for the grill or oven. Great for your food truck, grill, cafe or home kitchen. Great for cutting your pie up in perfectly sized proportions. Pick one up for your bakery, cafe or home kitchen! Click here for a map to find us. Outside these Texas communities? No problem, just order online. We will save you money on affordable restaurant equipment and supplies. ProProcessor sells dough mixers, meat slicers, blenders, stock pots, dumpling makers - meatball makers, ice cream machines, bread slicers, deep fryers and so much more.